I’ve been making compilations of music ever since I was about 12 or 13 years old. 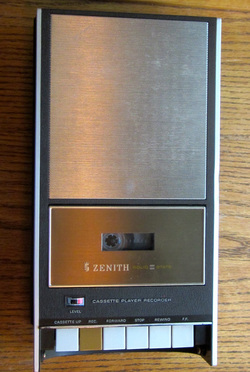 Before I had a stereo, I would take my father’s big old Zenith cassette recorder — the one he got from his Sohio “bonus points” catalog for selling a million air filters, 500 fan belts, and countless quarts of oil at his Sohio service station — and record the WIXY 1260 Top 50 countdown. With the utmost technical precision I would stack a pile of library books high enough to cradle the Zenith’s cigar-sized microphone in the crook of the top book’s spine — about four inches directly across from the speaker on my clock radio. Hi-fidelity at it’s finest! When the show began I’d punch the white play and brown(?) record buttons, tip-toe out of the room, and quietly close the bedroom door behind me. Sometimes I’d forget to flip the tape after 45 or 60 minutes. Sometimes I’d ask my brother to do it and he’d forget. Sometimes I paid my brother and he’d still forget. If all went well, I’d have 120 minutes of hit music to listen to with the ability to fast-forward through the inane AM radio banter between the songs. I could just as easily wind up with a tape of someone obliviously vacuuming the upstairs carpet, slamming dresser drawers and closet doors, or yelling downstairs about not wanting to do homework. In graduate school I had two friends who were experts at creating mixed tapes. Not just because they had superb taste in music, but also because they bought so many 45’s it was the only way to coral them into a truly manageable format in a world where iPods were probably nothing more than a sketch on the drawing board of Steve Jobs mind. Soon I was part of Andy and Steve’s weekend musical safari’s to all the various record stores in town, and busy putting together my own mixed tapes comprised mostly of the singles we purchased. The tapes had crazy themes and whacky names like The Sleepy Jesus Tape and A Lintbrush is Not a Fuzzbuster, to name a few. To this day some of my all-time favorite songs exist only on tapes from that era. Some of those tapes have track listing printed on the scribbled artwork of my sons — back when they did some of their best work in a highchair. Some of those tapes were musical reminders of home. They showed up at the front desk of hotels in England and Las Vegas with music full of love and longing and silliness. It became tradition that any time my sisters visited, we would spend an evening rummaging through my record collection and alternately picking songs and putting together a tape. Eventually Cathleen would come prepared, traveling all the way from Seattle or Huntington, West Virginia with a wallet of her own CD’s. Later, even brother-in-laws were not exempt. I still enjoy listening to those tapes and trying to remember the order of who picked what and why. These days I’m much more sophisticated and high tech in my delivery format, but the early spirit of mixed tapes lives on in the form of compilation CD’s. I don’t create quite as many of these as I once did, but every December, as some of you know, I try to look back at my favorite new music and come up with a “best of” compilation for the year. Despite the disappearance of record stores and the deplorable state of the music industry, I’ve been hard-pressed to restrict my favorites to two discs three years in a row. I’m not bragging when I say that — merely throwing down the gauntlet to anyone who wants to debate whether or not there is any good, new music around these days. What I really enjoy, is not only creating these compilations and sharing cool new music — but also listening to the mix-discs I receive from others who share a similar love for music. Each mix I get is so different and unique to the person who created it. Each one opens my mind and ears to new sounds I wouldn’t necessarily know about or pursue on my own. And while it’s true that some of the songs resonate more than others for me, I’m keen to listen because there’s no randomness in the process. Deliberate choices were made. Artists were chosen. Songs were picked and, in some cases, recorded to disc in a very specific order. In most cases covers were even designed and titles created. You can call the end-product of all that a thoughtless amalgamation… but it’s not. At least not to me.